Our range of products include pre engineered buildings. Cost cutting comes with high efficiency when you go for Pre Engineered Buildings. They are made out of steel and have a clear span design to ensure maximum space utilization. They are easy to install and save cost when compared to conventional buildings. They are flexible and easy to expand, also the delivery is fast so that there is minimum waiting time. They decrease the project cost and can be relocated with ease. 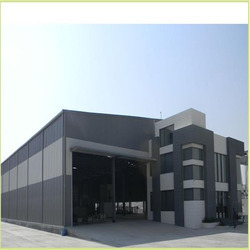 We have worked for many projects and are experts in erecting the buildings. Executed projects for Textile, Cement, FMCG, Warehousing, Marble & Granite Processing industries. The projects executed by us have been in the range of 20,000 to 1,50,000 Square Feet.